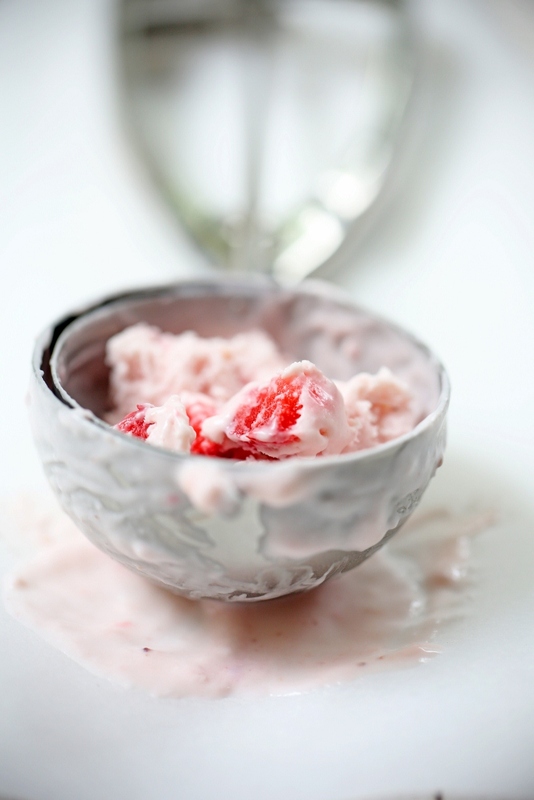 As promised, I will share with you the result of my strawberry ice cream from our u-pick strawberry trip. I have very little experience with ice cream making and couldn’t wait to try a recipe from Jeni’s Splendid Ice Creams at Home. Did you know that it was nominated for the James Beard Award? Crazy! Then again, it’s not a surprise. With many unique recipes and a different approach to making creamy ice cream, Jeni makes her process accessible for non ice cream connoisseur like me. 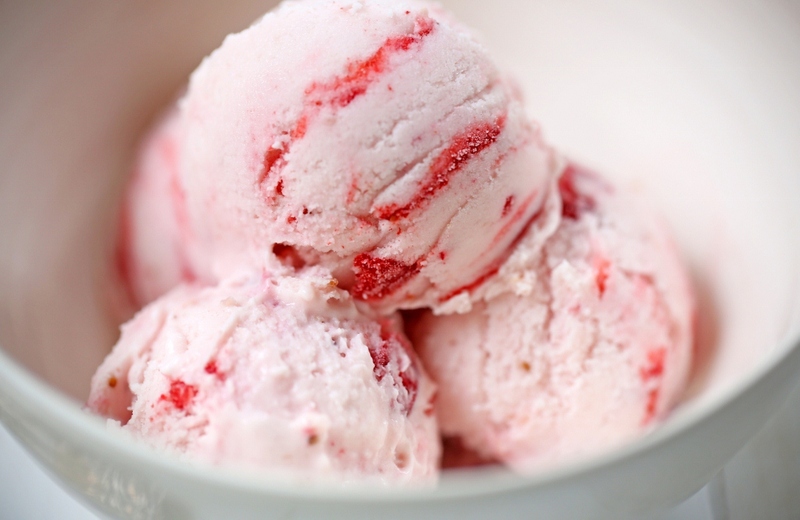 Anyway, back to the strawberry ice cream! 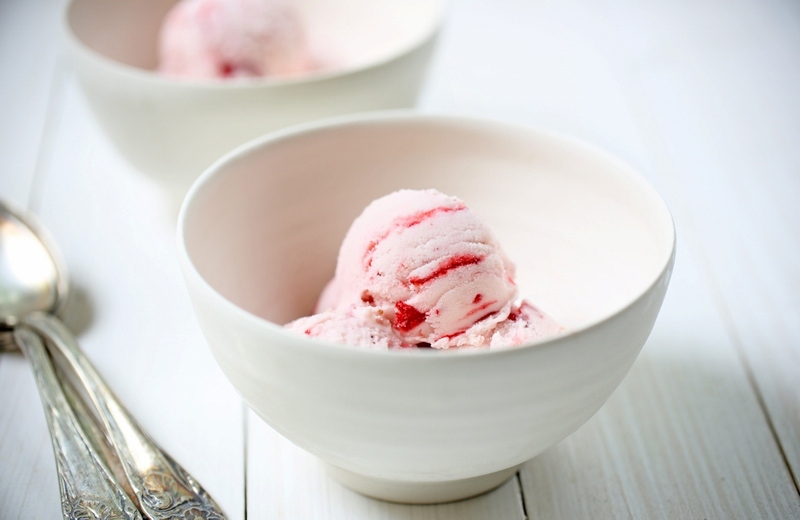 The only recipe that came close to what I was looking for was the roasted strawberry and buttermilk ice cream. I am not a huge fan of buttermilk and decided to substitute heavy cream for the buttermilk. It turned out great, but a bit too fatty for our liking. I know what you’re going say! Ice cream is supposed to taste fatty. So I made a second batch and skipped the cream cheese altogether. Both Vu and I like version number two much more. I love how fresh and creamy it tasted. And of course, full of strawberry flavor. What a treat! We cannot wait to try her other recipes. 1. For the roasted strawberries, combine the strawberries with sugar and bake at 375˚F for 8 minutes or until just soft. Let it cool slightly. 2. Puree the roasted strawberries in a food processor with lemon juice and measure 1 cup of the puree. 3. Combine 2 tbsps of milk with 2 tbsps with cornstarch to make a smooth slurry. 5. In a saucepan, combine the milk, cream, sugar, and corn syrup and bring to a boil over medium-high heat for exactly 4 minutes. 8. Add the roasted strawberry puree and blend well. 9. Pour the mixture into a 1-gallon Ziplock freezer bag and submerge the sealed bag in an ice bath until cold, about 30 minutes. 10. Pour the ice cream into the frozen canister of your ice cream machine and follow the manufacturer’s instructions. 11. Spin until thick and creamy about 25-30 minutes.